2019 UPDATE..........We are working on this right now. The 2019 Reunion will be held in the Ft. Campbell area. 2020 will be somewhere in the North. I am also looking at a return to the Boeing plant in Philadelphia. Just a peek at what is in the future. We are looking for another “lost” Hillclimber. A Vietnam veteran who served in the Delta named Frank Yungwirth has an old Zippo lighter in his possession and he cannot remember where he acquired it. He had no idea how to go about looking for the individual whose named is engraved on the Zippo. 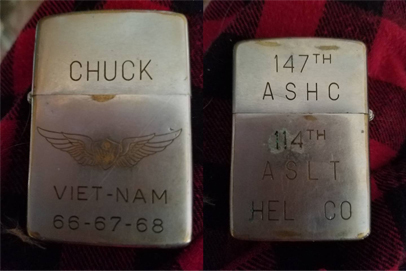 He was steered to our site because the 147th ASHC is also engraved on the lighter. The 114th AHC is also present. Most likely this “Chuck” was in both outfits. We don’t have any Chuck listed who was in the Hillclimbers before 1969. Also, anybody from the 114th AHC Association and their website who can supply any help would be appreiated. If you would like to see a copy of Dad's obituary, it will be posted at the link below in the next few days. Memories and comments can also be left at that web site. error. Sorting out Dad's email addresses has been "interesting". This link will take you to a review of The History Channel presentation called "Vietnam In HD." It is written by Rodney Brown and is not intended for the easily offended. You can visit this link at The History Channel website store and buy this documentary here. This is an interesting link to a story about the recovery of a Hillclimber Chinook that crashed into a canal during the Vietnam War. It is told by the people who actually did the recovery. Download PDF here. 18/12/10: "Hillclimber 17" has been found! THE ORIGINAL ENTRY IS BELOW. The update is below the line. This Zippo Lighter is from late 1969 to 1970. It belonged to a CW2 Pogo, aka Hillclimber 17. Since no CW2 Pogo shows up on any Vietnam Veterans lists and is also not listed by the Vietnam Helicopter Pilots Association rosters we are assumining that "Pogo" is a nickname. This lighter is now in the collection of a menber of the Swiss Army General Staff. LTC Rolf Gerster collects these lighters and has several in his collection. His website can be reached by going to www.gersters.ch. CWO Richard R. Jackson was Hillclimber 17 with the nickname of "Pogo." He passed away 15 February 2010. He was the half brother of Joseph Pisano. I'm sorry that the news could not have been better. There has been an interesting development with this case. CWO Jackson has a nephew who contacted me and maintains that he had no brothers, either full or half. At this point all I can think of this situation is that soldier's have this habit of referring to each other as brothers and it is not a stretch that some soldiers would use the word "half" as a term of endearment.